​Yes, I absolutely LOVE helping the kids we serve and am honored to be a part of their progress. However it is those moments when I see the light of HOPE return to their parents’ eyes that is truly my biggest paycheck! ​Our programs, puppies, social skills training, field trips and events ALL depend on the volunteers that drive, inspire and work to make them unique! if you, your family, friends, church, or business is interested in volunteering, please email terri@paws4autism.org. We work to make the volunteer opportunity match YOUR skills and availability! 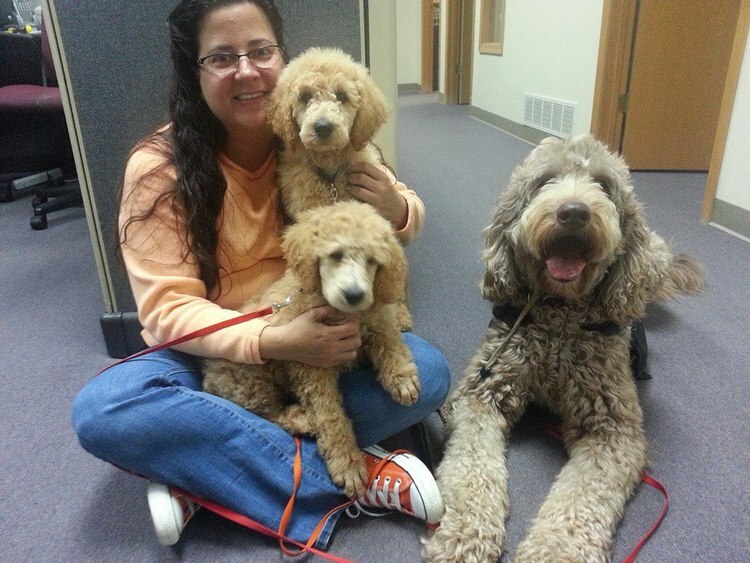 ​Puppy Partner Glenda at work with Franklyn while Cooper & Kozmo come for a visit. Paws 4 Autism always needs puppy partners. The more puppy partners we have, the more autism service dogs we can place with the people who need them. Our puppy partners are very special people, and we depend on them to help get our babies off on the right paw. As a Puppy Partner you bring one of our service dog candidate pups into your home and care for him. Puppies are rotated through Partner homes every 6-8 weeks. This helps them gain as much socialization and exposure to new environments as possible. During the dog’s time with you, we pay for food, veterinary care, equipment, and training. There are few things in this world more heart-warming than handing your pup’s leash over to its new partner and knowing that you’ve given an autistic youth and their family a level of independence they didn’t have before. Where else can one person have such a direct, profound, positive impact on another person’s life? To learn more about what's expected of our Puppy Raisers, refer to the FAQ page. ​By welcoming one of these amazing dogs into your family for several weeks, you will play a vital role in making someone else’s life whole again. What a tremendous gift you can give! Our events are hard work, however it is the volunteer committees that make them FUN!!! Whether it is for the Funny Bunny 5k, Dog-Gone Egg Hunt for Autism, Fireworks Tent or Sandy Paws Volleyball Tournament we are sure to find an event that fits your availability and skills. Please email terri@paws4autism.org in you are interested. ​PAWS 4 AUTISM Board Members will consider PAWS 4 AUTISM a philanthropic priority and make annual gifts that reflect that priority. So that PAWS 4 AUTISM can credibly solicit contributions from foundations, organizations, and individuals, PAWS 4 AUTISM expects to have 100 percent of Board Members make an annual contribution (or securing of Donor/Sponsor) that is commensurate with their capacity. ​PAWS 4 AUTISM’s Board Members will serve a three-year term to be eligible for re-appointment. Board meetings will be held quarterly and committee meetings will be held in coordination with full board meetings. ​This is an extraordinary opportunity for an individual who is passionate about PAWS 4 AUTISM’s mission and who has a track record of board leadership. Selected Board Members will have achieved leadership stature in business, government, philanthropy, or the nonprofit sector. His/her accomplishments will allow him/her to attract other well-qualified, high-performing Board Members. Service on PAWS 4 AUTISM’s Board of Directors is without remuneration, except for administrative support, travel, and accommodation costs in relation to Board Members’ duties.